The rapid growth of higher education in South Korea has demonstrated various changes in its speed, scope, and system within a short period of time. In 30 years, higher education enrollment rates increased more than sixfold from 11.4 percent in 1980 to 70.1 percent in 2010. The system of higher education remained an elite system through the 1970s and then transitioned into a massification stage during the 1980s and through the 1990s, becoming a universal system in the 2000s. The rapid changes in the characteristics of Korean higher education provide an unprecedented case considering the history of higher education globally. 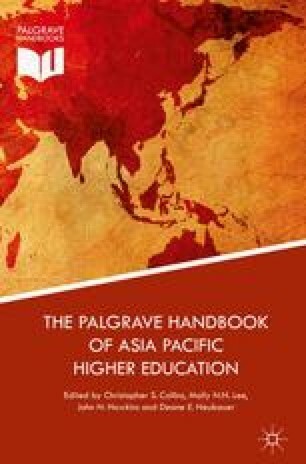 This chapter comprehensively reviews the rapid growth of higher education over the past 50 years, analyses key dilemmas facing Korean higher education, and discusses future resolutions for developing higher education in South Korea. International Monetary Fund (IMF). 2013. World economic outlook database. International Monetary Fund. Available on-line at: http://www.imf.org/external/pubs/ft/weo/2013/02/weodata/index.aspx. Accessed 16 Jan 2015. Joongang Ilbo. 2014. 2014 university evaluation. Joongang Ilbo. Available online at: http://univ.joongang.co.kr/university/totalRankingReport.asp. Accessed 16 Jan 2015. Korea Higher Education Research Institute (KHERI). 2012. Problems of colleges structural reform policy focused on weeding out. Korea Higher Education Research Institute. Available online at: http://kheikhei.tistory.com. Accessed 9 June 2014. Korean Educational Development Institute (KEDI). 2013. Statistical yearbook of education. Korean Educational Development Institute. Available online at: http://kess.kedi.re.kr/index. Accessed 15 July 2014. Ministry of Education and Korean Educational Development Institute (MOE & KEDI). 2014. Statistical yearbook of education. Ministry of Education and Korean Educational Development Institute. Available on-line at: http://kess.kedi.re.kr/index. Accessed 15 Dec 2014. Statistics Korea. 2014. 2013 social indicators in Korea. Statistics Korea. Available online at: http://kostat.go.kr/portal/english/news/1/19/5/index.board. Accessed 5 Nov 2014. The Bank of Korea Digital Library. 2014. 2013 national account. The Bank of Korea Digital Library. Available online at: http://dl.bok.or.kr/search/DetailView.ax?cid=676441. Accessed 8 Jan 2015. Yeom, M.H. 2015. Critical reflection on the massification of higher education in Korea: Consequences for graduate employment and policy issues. Journal of Education and Work 29(1): 48–63. doi: 10.1080/13639080.2015.1049026.